"The Vietnam War," the 18-hour documentary about the divisive conflict, concludes with an excerpt from Minnesota author Tim O'Brien's collection of short stories, "The Things They Carried," a decision that one key player fought against. 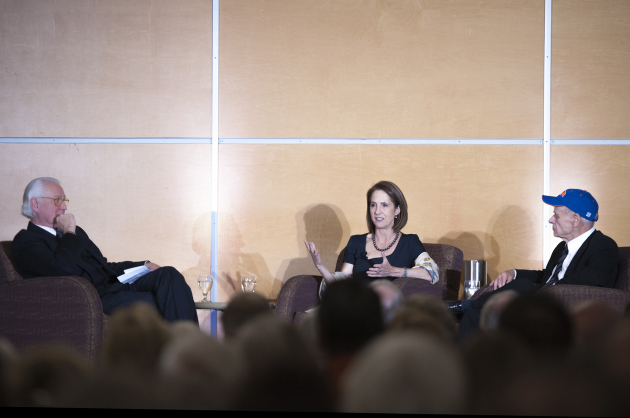 "I hate watching myself on television," said O'Brien, who appeared Wednesday night at his alma mater, Macalester College, along with "War" co-director Lynn Novick, for a public forum hosted by former WCCO anchor Don Shelby. Novick, who partnered with Ken Burns, said the Worthington-raised veteran was a key reason the film resonated with the millions of viewers that helped make it one of the most viewed programs in PBS history. "I didn't think about this until just now, but Tim was the first person we talked to when starting with the project," she said backstage, shortly before the panel discussion. "Ending it with him seems very fitting." Despite his reservations about being on camera, O'Brien said he was honored to be among the roughly 100 people interviewed for the project. He praised Novick and Burns for doing their homework before chatting with veterans from both sides of the war. "I took classes at Harvard, and talking to Lynn and Ken was like taking an advanced seminar," he said. O'Brien also participated in a discussion on campus Thursday with Macalester professor and Booker Prize winner Marlon James.